Give me pies, give me sweet little pies. (Gimme, gimme pies) Oh no, no, you can't disguise...that these are tiny pies. You'll soon be able to purchase that track, along with many others, when Russ, Sandy, Sonia, and I finish recording our second album, Jammin' with Joe, which will be available on iTunes shortly. It will also feature hits like "This Cheese Is Made for Grillin'" and "It's a Super Fruit!" It's the long-anticipated follow-up to our hip-hop debut, TJ's and DJs. We'll hopefully be going on tour in the spring, opening up for the newly-reformed Nirvana with Joe Jonas doing his best to fill the shoes of the late Kurt Cobain. It's gonna rock. Know what else rocks? 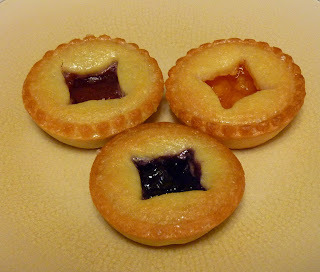 These tiny pies. That is, unless you're trying to lose weight. Or maintain your current weight. Or not become morbidly obese. I know they're desserts, but seriously? 20% of my RDA for saturated fat in one pie? And who really stops at one pie? Not I, certainly. Sure, leave a comment belittling my lack of willpower, hinting that only children eat foods like this and that furthermore, your five year old was able to stop at just one pie. But really, you've got to try at least one of each flavor, right? Ok, that puts you at 60% of your RDA for saturated fat. And they're not very big at all. They are truly miniature pies. So you eat three and you're still hungry. And we're all shopping at Trader Joe's to pretend that we're eating healthy, right? But yes, they do taste good. However, not all pie fillings are created equal. I found that the amazing, soft, buttery crust overshadowed the fruit filling in all but the strawberry pie. The strawberry flavor was tart, sweet, and strong enough to blend with the bready parts. 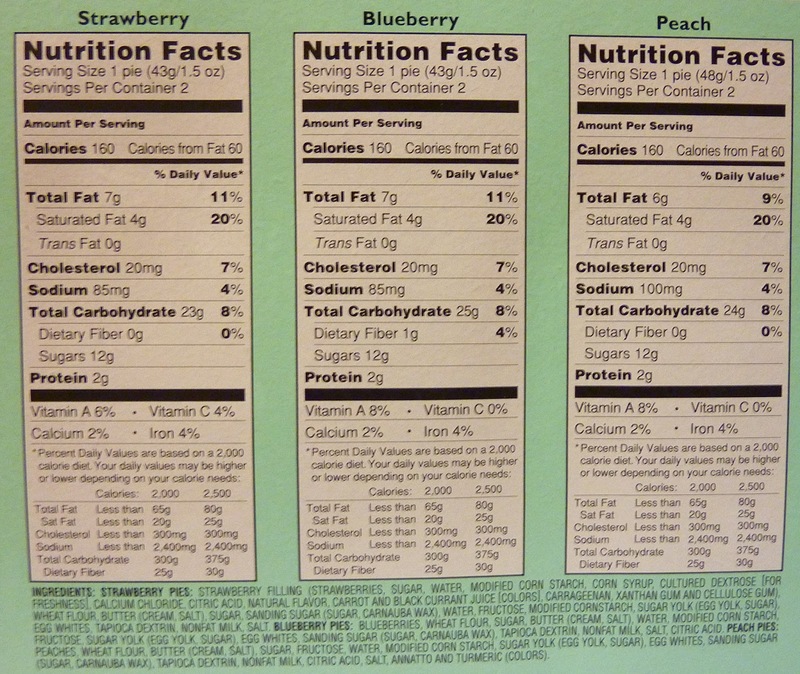 It's not that I didn't like the others, I just wanted the fruit flavor to be stronger. It felt and tasted like I was eating a hot, soft butter cookie—the kind with the little globs of purplish or yellowish jam in the middle, except in my opinion there's never enough of the jam...and man, that crust just melted in my mouth and was so rich and yummy that I just forgot all about the fruity center. 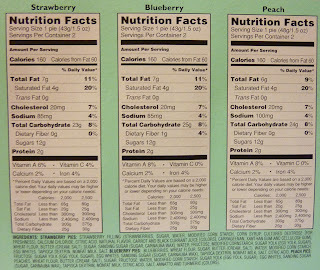 And it's strange that I liked strawberry the best because in almost any other scenario, blueberry would be my favorite flavor and strawberry would be my least favorite. Sonia felt like the fillings were more or less the same. She actually preferred the blueberry slightly. She wishes there were more pies in the box and thinks that $4.49 for six pies isn't a very good value, but because she was absolutely wowed by their decadent taste, she gives this product 4 out of 5 stars. Because of the amazingly delicious crust, I can't go lower than 3.5 stars. LOL, Susan. Betcha can't eat just one! Is it wrong to sandwich ice cream between two mini pies and then eat it? If it is I'm still doing it anyway. lj, that would be delicious. Fattening, but delicious. Do you guys take request? TJ's is rolling out their fall pumpkin stuff nowish/soon. It would be fun to see some of these seasonal items posted! Just type in "pumpkin" in the search box under the blog intro, and you'll find page after page of seasonal reviews—and we'll definitely be adding more soon! Where can I get tickets for the tour? I love concerts where I can sing-a-long. :) You make reading about food so very engaging. Thank you for this review. 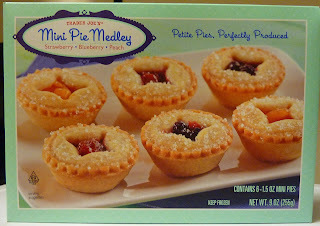 I think for now, I'll steer clear of these mini-pies. I doubt I could eat just one. Thanks for reading, Lindsay! And thanks for your kind words. The flaky crust sounds delicious! Sounds easier than baking, that's for sure. I just bought some! they are AMAZING people!! I thought they were tasty, but I was annoyed by their lack of resemblance to the pies on the box. The ones on the box are overflowing with whole pieces of fruit, where the actual pies are just jam in a delicious crust. I think they would be super awesome (and more worth the price tag) if they had whole fruit in them.